First Pharr School 1911, Pharr, Texas. 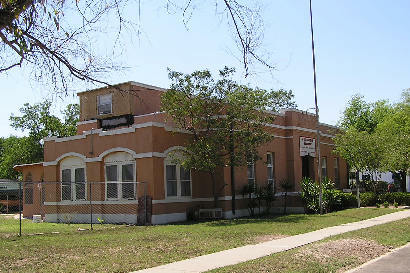 Erected in 1911 as a one-story structure, this building housed the first school in Pharr. John Bales, the contractor, built a number of the town's early structures. Classes were held here until 1915, when enrollment had grown from nine students to almost 80. 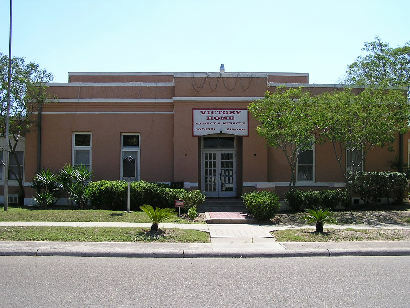 During that time, the building also served as a community church. 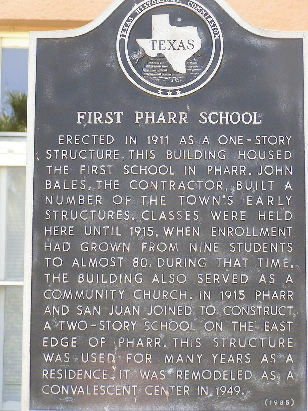 In 1915 Pharr and San Juan joined to construct a two-story school on the east edge of Pharr. This structure was used for many years as a residence. It was remodeled as a convalescent center in 1949.